We are proud to announce that Hotel Esprit Saint Germain has been granted five star status, one of the first of two hotels on Paris' Left Bank to be nominated with this prestigious rating. 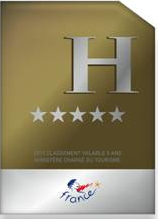 The significant distinction is a result of the hotel’s continued commitment to excellence in service and hospitality. Hotel Esprit Saint Germain has been designed along the lines of a private residence. Ideally situated in the heart of Paris, on the Left Bank. This is a very Parisian, very intimate and warm 5* boutique hotel, stunningly designed with real loving care put into each of its 28 rooms and lounge. Clients are welcomed as if they were guests in a friend's home with a personalized and dedicated service, enjoying complimentary drinks anytime during their stay sitting in the living room by the fireplace. It is just what you imagine a French hotel should look like.